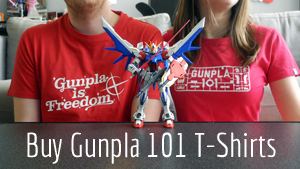 For many Gunpla builders, Gundam anime is what inspired us to get started. So it naturally follows that if you got into Gunpla because of a cool-looking Gundam in a TV show, you’re going to want to build a Gunpla just like it. However, this isn’t always the best idea. In recent years, Gunpla quality has dramatically improved when it comes to appearance and ease of build. Gunpla parts come out of their sprues more easily now thanks to Bandai’s new “wedge gate” technique, plastic colors are brighter, and an improved molding offers more detail and better sturdiness for posing. Furthermore, the Revive series, which re-introduces some of Gundam’s classic favorites with new models, is designed to give older kits a much-needed makeovers. In other words: if you buy a Gunpla kit released in 2013 or earlier, you’ll have to work a lot harder to make your outdated kit look good. If you like Mobile Suit Gundam… pick the HGUC RX-78-2 Gundam Revive. Released in 2015, this is one of the best examples of the new “wedge gate” system as well as the improved ease of build the Revive series offers. Its mostly-white armor hides nub imperfections so you don’t have to do a lot of work to make a gorgeous kit. If you like Zeta Gundam… pick the HGUC Hyaku Shiki Revive. Unlike previous versions of the Hyaku Shiki, this model’s gold body is prismatic but not mirror-reflective. That means it is a lot better at hiding nubs while providing a more realistic (and less cartoony) version of what a real Hyaku Shiki might look like. If you like ZZ Gundam… pick the RE/100 Bawoo ZZ. Launched in 2014, the RE/100 series brought kits with a High Grade level difficulty to the 1/100 scale. It meant that kits like Bawoo, which were previously too unwieldy and complicated to be easy to construct, could be both easy to build and attractive and poseable when complete. If you like Char’s Counterattack… pick the RE/100 MSN-04 II Nightingale. Most Gunpla kits from Char’s Counterattack are over a decade old, and you can tell. The Nightingale was a much-needed breath of life into this movie’s Gunpla offerings, with bright red plastic and a unique silhouette. Keep in mind this kit is HUGE; make sure you have space for it! If you like Victory Gundam… pick the HGUC V2 Gundam. Even though the show is called Victory Gundam, the V2 is the much better looking of the two, with its distinctive yellow “V” shoulder blades. Released in 2014, this is the latest High Grade version of that Gundam as of this writing, and by far the most poseable. If you like Gundam 0080… pick the HGUC GM Sniper. Gundam 0080 is less about reinventing mobile suits and more about the human cost of war, so most of the suits (like the Alex) are pretty standard. The most recent HG release from the series is still pretty old—2012’s GM Sniper, which captures the show’s gritty realism. If you like Gundam 0083… pick the RE/100 GP04 Gerbera. Bandai says they started from original series art for this Gerbera model, so it’s unlike any other 0083 kit before it. With its massive size and simplified joint structure, it’s super poseable, too. Because of its color and detail, fans say they thought it was a Master Grade from a distance! If you like G-Gundam… pick the HGFC G-Gundam. Unfortunately, G-Gundam’s model count has not kept up with its popularity. There haven’t been any new ones since 2011, so none of them look very modern. But for the best bargain, this one is usually $15. I’ve built it twice and used it to learn to paint Gunpla! If you like Gundam Wing… pick the SD EX Wing Zero. Did you know Gundam Wing models are still the most popular sellers in North America? They’re still being made and with a lot of variety, too. We love this Endless Waltz Wing Zero from the latest SD line, SD EX-Standard, which is tiny and cute but poseable, too. If you like Gundam: The 08th MS Team… pick the HGUC GM Ground Type. I used to tell fans of The 08th MS Team, “Just pick a kit from another show” because the model kits from this one were so old! Luckily, 2017 has finally seen a new release, and it’s the iconic ground type the MS Team uses. Would look great with a little weathering. If you like After War Gundam X… pick the HGBF Gundam X Maoh. There hasn’t been a new Gundam X model for almost a decade, but Gundam Build Fighters introduced a memorable tribute to the show’s titular mobile suit. It’s not the same thing, but it includes all the most recognizable elements that we love about the original. If you like Turn A Gundam… pick the HGCC Turn A Gundam. Hope you like mustaches! The latest model from this show hails from 2014, and is sleek and practically made to be panel-lined. Designed by Syd Mead, it’s one of the most unique Gundam designs, and preserved well in HG form. Unfortunately it doesn’t come with a cow. If you like Gundam SEED… pick the HGCE Strike Freedom Gundam. Part of the Gundam Revive series, this late 2016 model is a stunning but surprisingly simple build. Gundam SEED has some of the most elegant mecha designs in the multiverse, according to my personal opinion, so even this High Grade looks fancier than most. If you like Gundam SEED Destiny… pick the SD EX-Standard Destiny Gundam. Oddly enough, Gundam SEED Destiny is one of my least favorite shows, but one of my favorites when it comes to Gunpla selection. The latest and greatest is an SD EX from 2017, which keeps Destiny poseable but with cute new proportions. If you like Gundam 00… pick the RG 00 QAN[T]. This is among the easiest Real Grade kits, but still more difficult than your average High Grade. That said, I’m recommending it as a beginner kit because it is by far the nicest and newest 00 kit in a while. It will take you longer and require more concentration than the others listed here, but in the end you’ll have a beautiful, sturdy model you’ll be proud to display. If you like Gundam Unicorn… pick the SD EX Sinanju. We’re huge fans of the Sinanju in every form, and this is by far the easiest and most approachable version for beginners. While the titular Gundam and Banshee counterpart can be a little tricky for beginners, the Sinanju is right on the money. If you like Gundam Build Fighters, Gundam: Reconguista in G, Gundam: Iron-Blooded Orphans, Gundam Thunderbolt, or Gundam: The Origin… pick anything you want! These four shows all came out in 2013 or later, and as a result they have the newest and most regularly updated Gunpla selections. All of their model kits are modern by default so when it comes to selecting a beginner kit from one of these shows, simply pick the High Grade that looks coolest to you. You can be assured it’ll be using the latest of Bandai’s model technology! What was your first Gunpla kit? Was it too easy or too hard? Did you pick it based on how it looked, or based on which series it came from? Let us know in the comments!